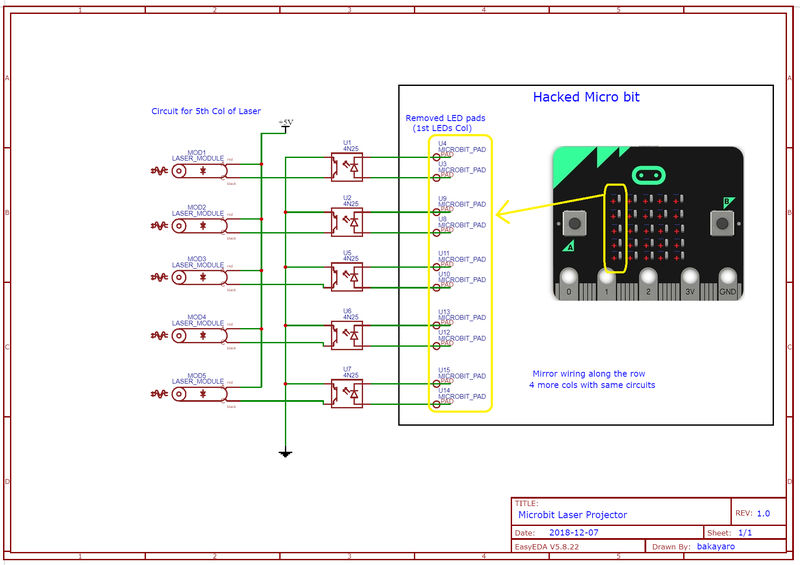 This project demonstrates a simple laser projector made with 25 dot laser diodes driven by a hacked micro:bit. It is a wearable device to project text messages on any flat surface. As for the programming part, Ada is used to program the micro:bit board to generate text massage with the lasers. The Compiler/IDE used for the programming is GNAT Studio from AdaCore. 25 Optocouplers are placed on a protoboard and soldered (+micro:bit). A protoboard is added to breakout the I/O pins of micro:bit for future development. Original Idea was to use 25 Laser diodes but 20 Lasers (4 Columns) is enough to display and project scrolling text. From this link : https://www.adacore.com/download, following two exe files are downloaded and installed on a Windows PC. Nightmare Warning: Laser Beam Alignment! Following "+" code can be used to align the beams against the center beam to adjust dot spacing and angular position. I wish I didn't start this project! --  This simple example shows a scrolling text on the micro:bit LED matrix. --  Programing Studio on the micro:bit. --  that the human eyes sees all the LED lit together (persistence of vision). --  timers are implemented in the Generic_Timer package.